Lizzy Hawker | ke garne? There is a saying here in Nepal that says it how it is. Ke garne? What to do? – because sometimes you just don’t know. And when you don’t know what to do; then what do you do? You just go on doing what you do. You go on trying, you go on failing, you go on trusting, you go on loving, you go on living. Ke garne? It is something you would say when you are faced with a difficult, frustrating or challenging situation. It is what you would say if you had a pain in your leg that worsened on steep inclines; but when rest would be out of the question because your daily chores involved walking long distances up and down hills to collect wood and leaves; and those leaves and pieces of wood that you gather would be what allow you to cook and heat your home. Ke garne? What to do? It is a saying that doesn’t ask for an answer. It is a saying that describes that feeling of being between a rock and a hard place. It is a saying that accepts and surrenders to how things are. Because only then can you decide how to react or not react to the situation. I have a pain in my leg. And I’m in the middle of a spell of not running to try to avoid full blown injury. No running. Again. Ke garne? I’m lucky. I don’t have to walk up and down hills to keep the wheels of life turning, to keep warm, to eat. I don’t have to gather leaves and wood just to let me cook and to let me heat my home. Life in Kathmandu has its own challenges for sure, 12-18 hr power cuts, intermittent internet, sporadic hot water, the list goes on. But I have choices. I have a bed to sleep in, food to eat. So life is easy really, isn’t it? We don’t need all that much when we think about it. Or at least the things that we really need aren’t of the material kind. I thought I’d been smart this time. I took time (2 months) not running after the femural stress facture that prevented me racing the 2013 UTMB. I tried to be patient. 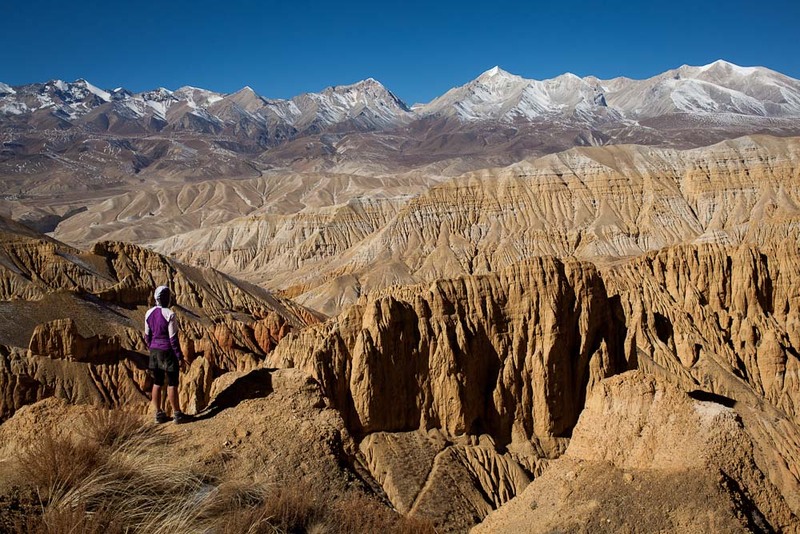 I mixed up the walking and running during the Manaslu Mountain Trail and ran a bit more during the Mustang Trail Race. I allowed myself to take it slowly. I soaked up just being in those awesome places and sharing the experiences. I was gradually working back to some kind of race fitness. I raced 50km on the rim of the Kathmandu valley, slowly, not full out. So what happened? You can ask the questions. You don’t always find the answers. Does it matter? Why do we run? It is an expression of who I am. That is why I run. Simply that. But there are other expressions of whatever is ‘me’ also. And I can make the choice not to run for a while. I made that choice today. I went for hours on borrowed bike. Children said hello. And when children say hello, it demands an answer with a smile. They don’t need to know that I’m crying inside. Because with every injury it gets that little bit harder to keep trusting, to keep believing. And so I smiled. Running is a luxury. But it does give us context within which to cultivate physical, mental and emotional health. It can give us discipline. It can give us the motivation to question ourselves – to decide what amongst the myriad of obligations of daily life is most important to us. It can allow us to put ourselves in situations in which we are challenged and forced to step outside of our comfort zone. It can teach us humility. But when the running itself becomes our comfort zone. What then? Ke garne? What to do? A run is a little bit like life. The ups, the downs, the joy, the pain. But a run is simple. Life is more complicated. Can what we learn on the trail help us in life? Because there will always be the days when we say ke garne? What to do? And simply not know. And then the only answer we have is to go on doing what we do. Whatever it is that makes you say ke garne; surrender, accept and then go on trying, failing, trusting, loving, living. great writing Lizzy! there is so much unreadable new-agey gibberish out there of the why-do-i-run and running-as-self-discovery, or, even worse, running-as-self-improvement kind that it’s easy to forget that meaningful running-inspired reflection is possible. very much looking forward to you book for more of this. LUV the way you write Lizzy! I could FEEL it .. Thanks, Lizzy. Great piece! Looking forward to the book. And best wishes for a quick recovery. You are a beautiful person and truly an inspiration. You have an amazing journey, no matter what. Keep up the positive outlook, Lizzy. You are so good at finding inspiration around you! Thought provoking Lizzie as always. Is running important – yes. To the runner it is important for wellbeing, both physical and psychological. To friends, family and the community it is also important – don’t underestimate your impact of inspiring others Lizzie, whether that is to run competitively or socially or simply to follow dreams unrelated to running. The benefits that running brings are substantial, multiple and important to society. Like everything else, there can be unwanted effects too but the balance is usually clearly beneficial. Wishing you a rapid return to inspirational running. Gutted for you Lizzy. I saw you at the Refuge Bonatti checkpoint on the UTMB last year (I was the one that announced “If that was 7 and a half km then I’m a Scotsman” as I arrived.) I remember being massively impressed then that you would put yourself through the agony of watching others compete while you were injured. To be still injured, especially in such a inspirational part of the world must be doubly agonising. The only consolation I or anyone can offer is that injuries do repair. I lost a whole year once with an Achilles tear and have just this morning had my first successful run after a groin strain. Be strong and take care. Running, like any discipline, can be the means to seek to dominate our material being. Run, run looking for our limit… contemplating the beautiful universe that God created for us. Japanese has a phrase that is, I think, exactly analogous to “ke garne.” It is “shikata ga nai,” inadequately translated as “it can’t be helped.” It’s heard thousands of times a day, up and down the archipelago. Always loved your blog and thoughts Lizzy, wishing you good health from Irl, run well when the time is right. I enjoyed this post. I like reading runners’ blogs on why they run. I haven’t run for many years but I’m slowly getting back into it. Nothing makes me feel as good as running.